Tom Loeffler’s 360 Promotions will return with another outing of the ‘Hollywood Fight Nights’ series on Sunday, March 24, 2019 at the AVALON in Hollywood, CA headlined by junior middleweight clash between top undefeated prospect Serhii ‘El Flaco’ Bohachuk, (12-0, 12 KOs), of Ukraine, trained by Abel Sanchez and L.A. boxing veteran Cleotis ‘Mookie’ Pendarvis, (21-4-2, 9 KOs). 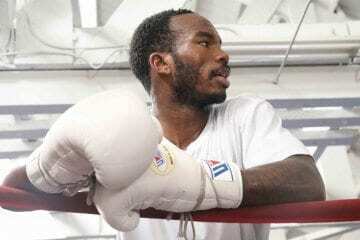 The card will also feature the following the bouts lightweight Mario Ramos in a six-round bout, super lightweight Devon Lee against tough San Francisco veteran Jhonathan Zamudio, bantamweight George Navarro taking on Joseph Cuellar and a few other bouts that have yet to be announced. Advance tickets for The VIP Boxing Experience priced at $150 (Limited Ring Mat Seating) $125 (VIP Front Row), $100 (VIP Second Row), $85 (Reserved Floor Seating) and $60 (Balcony) are now on sale online at www.360Promotions.us and through the interactive seating chart by clicking HERE. VIP Booths are also available by inquiring at [email protected]. Doors will open at 3:00 p.m. with the first bell at 4:00 p.m.
Training under the guidance of world-renowned Abel Sanchez, the 23-year-old Bohachuk has become known for his aggressive, fan-friendly style and show-stopping knockouts. Capping a sensational six-win 2018 campaign, all by knockout, Bohachuk returns to the ring following an impressive fifth round stoppage of Carlos Garcia Hernandez on December 8, 2018 in Carson, CA. The southpaw Pendarvis is currently riding a four-bout win streak, winning a unanimous decision over Rodolfo Esteban on July 1, 2017. Among his hometown victories over his fifteen-year career are wins over battle tested veterans Robert Frankel and Michael Clark. He also challenged former world title contender Dierry Jean in 2013 losing a hard-fought contest.